For some years now, the Catalyst Bullwhip has been available primarily in black, dark brown, tan & chocolate brown, with the option of a second highlight color in the knots. Although this is stated on the Noreast Whips main site, now & then I do build some Catalysts in other colors, such as the one pictured here in silver grey. The initial reason for the limited color choices on the Catalyst was because it was an entry level whip, so it didn’t have as many options as some other models. I tried to keep the cost down on this whip, while having a base set of colors on hand, in order to have a fairly quick turnaround time on ordering. At this time, I’ve decided to offer the Catalyst in whatever color the customer chooses, but with two restrictions: the thong can be of one color only; and as long as the color choice is available from one of my suppliers. Depending on the color chosen, there may be an extended wait on the order. A second highlight color in the knots is still an option. If you’re thinking of purchasing your first whip, or maybe just another bullwhip to use as a backup, the Catalyst is still one of the best choices out there for the price. Check it out on the main site at http://noreastwhips.com/bullwhips/catalyst/. If you have any questions, shoot me an email at noreastwhips@gmail.com. Thanks! 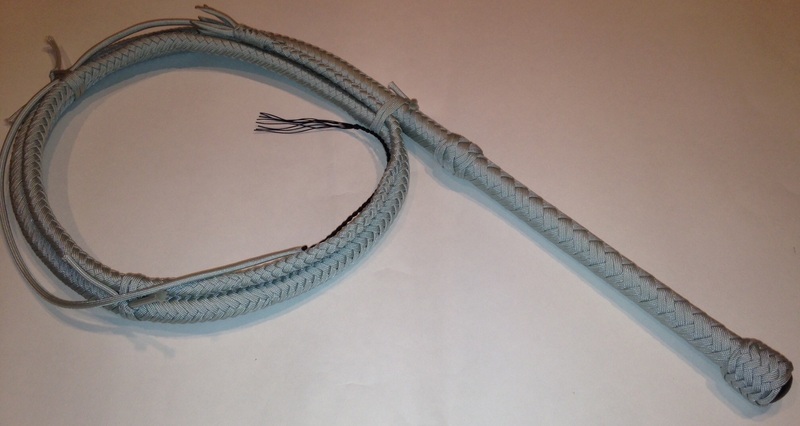 This entry was posted in Whips In General/Photos and tagged best nylon bullwhip, catalyst bullwhip, entry level whip. Bookmark the permalink.